When it comes to the safety of your family members, and even your property, you need to think of more than just burglars and security threats. Fire is also something that you should prepare for, especially due to the life threatening dangers that it poses. If a fire starts in your house, you have as little as 86 seconds to get out before flames and smoke overtake the building. This means that you need to be prepared at all times for an emergency, so you will know exactly what to do. Early warning systems like a fire alarm and an escape plan have been proven to save lives, so take a look at the tips below to learn what else you can do to keep your loved ones safe. Here are 4 fire safety tips to help you make your home a safer place for your family in case of a fire. Education and drills can save lives, even if your family finds it annoying or strange. Make sure everyone in the house, children included, learns about fire safety and basic actions that should be taken in case of a fire. This means that you need to plan an escape route from every room in the house, particularly the bedrooms in case a fire starts during the night. Draw a map of your home, including doors and windows, and identify the main exits to your home. Come up with the primary escape route, as well as secondary routes in case these primary ones become blocked. For second-story bedrooms, you can plan to include safety ladders in your evacuation routes, assuming everyone is old enough to manage a ladder on their own. It is best to practice fire drills every now and then so that if a fire actually occurs, everyone is less likely to freeze because of panic and react on instinct. Time your drills to make it a sort of game, with the goal being to beat the previous record, and to make your reaction times faster. It is also important to practice the safety drill in different seasons, if you happen to live in a location where distinct seasonal changes could affect your safety route. Snow and ice can make evacuation more dangerous, if you need to leave via ladder or the roof. It’s also important to remember that smoke can significantly decrease visibility, so practice evacuating in the dark so your family is familiar with navigating your home in the dark. You children like to play with whatever they find, and matches and flammable substances are a serious danger to them and everyone else in the family. It is not enough to simply explain to them that they need to stay away, as they are too young to understand. Make sure to keep matches, lighters, and other flammable items far from their reach. If possible, change the knobs on the stove and oven to safety knobs as an additional precaution. Cover electrical outlets and make sure to bundle up electrical cords safely. It is also important to keep highly flammable materials and items at least three feet away from any flame or source of heat. This can include the obvious such as stoves, fireplaces, and ovens, but don’t forget about space heaters, hair styling tools, and irons. In the winter, space heaters are the most likely item to be disregarded, and they cause many house fires by being placed too close to items such as curtains, rugs, blankets, and clothing. Never place clothing or towels on space heaters to dry them! Never leave the house or go to bed without going over the house quickly and checking that everything is turned off. Never leave burning candles unattended, don’t leave electric heaters on, or even plugged in, if you’re going to sleep or leaving the house. In addition, when cooking, be sure not to leave the kitchen if possible. You might be tempted to put something in the oven, then go out and run a few errands in the meantime. DON’T. It’s important to always be near by, because you could smell something burning, or see something you left next to the stove by accident that could easily catch fire. 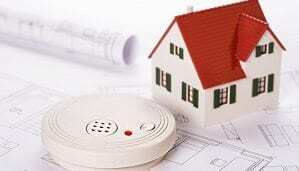 You should have smoke detectors in every room in the house as standard, and check them frequently to ensure they’re operating properly.In addition, many home security systems can be outfitted with advanced fire protection features for a small additional cost, including monitored smoke detectors that send a notification to a central monitoring station when an alarm is triggered. Check out our home security comparison table to find the suitable ones. There are a number of smart security tools that can help with this nowadays. There are home security cameras and home sensors that will pick up on anything that is out of the ordinary, and will alert you to an issue. While these are largely used for preventing burglars and break-ins, they can also be used as an early warning system, similar to a smoke detector.